My fiancé travels a lot for work, so when he’s in Dubai, we like to make the most of our time together. Cue an evening at Vu’s restaurant, in the iconic Jumeirah Emirates Towers. Having never been to Vu’s before, I wasn’t sure what to expect. 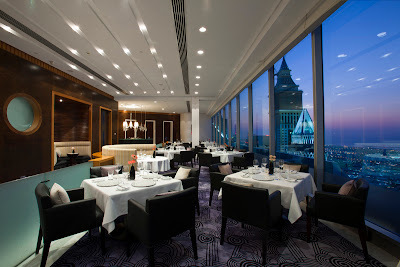 I’d heard all the stats: over 10 years’ of excellence in contemporary European cuisine, some of the best views in Dubai, gorgeous décor, the list goes on. And so last Thursday, my fiancé and I dressed up, called a cab, and then stepped into the glass elevators that whizzed us up to the 50th floor for an early Valentine’s dinner. The menu is by no means light on the wallet, but every mouthful is worth it. I promise. We opted for the four-course menu, specially designed for Valentine’s Day (Dhs600 per person for four courses and a glass of bubbly on arrival). The meal extravaganza kicked off with a hot and cold starter – Norwegian scallops and beef carpaccio (and a splash of aged Pinot Noir, thank you very much). As the courses stretched on, we came to the main event – I opted for the sea bass while my fiancé chose the veal tenderloin. He’s picky when it comes to meat, more often than not declaring that the cut, cooking method or presentation aren’t up to scratch. I held my breath. He cut a slice. My fork hovered in mid-air. He put the bite to his lips. I watched. He broke out into a broad smile. Winner! In fact, he said it might just be the best he’s had. Dessert didn’t disappoint either, and the creamy white chocolate ice cream and the dark chocolate crisp with marinated passionfruit and strawberry puree had us practically licking our plates. All up, we stayed at Vu’s for nearly four hours, enjoying the food, atmosphere and each other’s company. As Dubai buzzed along, 50 floors below us, Vu’s offered us the perfect place to escape for a much-needed romantic night out. Want to take your other half for a romantic dinner at Vu’s? The Above & Beyond experience is valued at Dhs1,200 for two, and includes four courses, a glass of bubbly on arrival and a surprise gift. To win, simply tell us why you and your partner need to go above and beyond at Vu’s. This prize is to be redeemed throughout the month of February. My hubby and I should win this competition. Not only is it Valentines day but it's also our anniversary on Feb 25th. Times have been tough since I've lost my job recently. Due to that we haven't planned anything special for the 2 big days of this month. It'll really bring a smile to both of our faces if we win! I am dying to arrange a surprise dinner/ activity for my other half however I cannot afford anything since time has been very tough at work for the last 1 year for me. I am joining so many competitions to make it come true...yet no luck until now.. We have 2 events to celebrate this month, the Valentine's Day and also our anniversary on the same day. Therefore I think I deserve to win this since I have done so many efforts and prayed a lot for this. I hope Cosmo team does think so. Please be the answer to my prayer oh Cosmo, he's an amazing man, help me to do something awesome and bring smile on his face:)..*begging on bended knee*..
Me and my BF has been together for 6 years now, both happy and contented. But sometimes, life draws challenges in our lives. His family petition him to go to France and it is already approved. He is just waiting for his papers to be finally done. I was devastated upon hearing the news, but I always keep my faith and be positive. I know whatever challenges we are facing now in regards to our relationship, we will get it through. So, I am hoping that by sharing our story, I will get rewarded by this great competition/opportunity of yours. Everyday, I am doing something special for him at least to make the most of our remaining time together. And I am hoping this dinner will leave a memorable moments into our lives. Jenni Kusuanco! Here's hoping you enjoy your meal and the rest of your time with your guy before he moves to Paris! Email features@cosmopolitanme.com for details on how to collect your prize. yippee!!! im so overwhelmed! Thank you so much! definitely we will treasure our moments together.. Your blog is nice , i really like your way of bogging there are so many beautiful points in your blog am also book mark your blog for the further information. Your blog is great update your content . i really like this place Desert Safari Dubai we really enjoy. Desert Safari Dubai is a lovely place for the family trip. I like to visit there again . desert safari dubai tours. is great place to have Dinner. Dhow Cruise Dubai is great place where you can have dinner..
desert safaris Dubai is one of the best place where you can enjoy your Dubai trip. desert safari Dubai great place where you can enjoy. one of the best place where you can enjoy your trip of Desert safari Dubai..
Dubai is also a beautiful place its lovely place for the enjoyment. DUBAI DESERT SAFARI interesting place.